The Jabberwock has always been a huge fan of one pot meals. Why ? Less cleanup of course ! This custom version of Goulash is mainly a way to get rid of the odds and ends of veggies and leftovers laying around in the fridge. The flavor of the dish is a little different every time depending on what I have to throw in it – this time I had some leftover meat sauce which give it a great flavor. 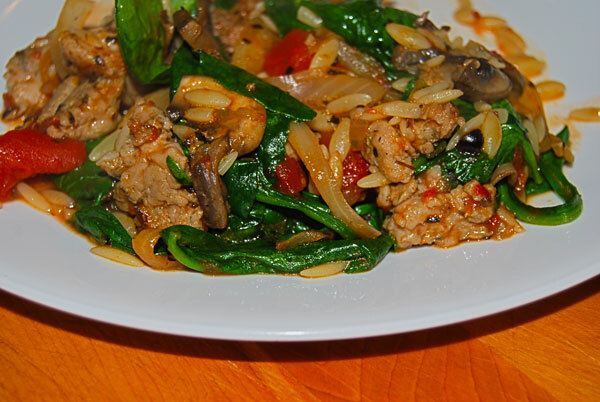 For a lower carb version just omit the orzo…… Here’s last night’s version. Cook the sausage over medium heat. Remove to a plate. Sautee onions in 1 tsp olive oil, remove to plate. Sautee mushrooms in 1 tsp olive oil. Add onions and sausage back to pan with the mushrooms. Add the meat sauce, canned tomatoes, salt, pepper, and basil, and simmer for about 15 minutes. While sauce is simmering, cook the orzo. Drain, and add to pan, stir in. Add the spinach and mix in. You can remove from heat for this step….the residual heat of the Goulash will wilt the spinach perfectly.